If you are making money, you are in business. If you stop making money, you will be out of business. At the end of the day, the financial health of your business determines whether you will succeed or fail. Given that, don’t you think it is rather important to have a strong financial understanding of everything that is happening in your business? Having a strong accounting function can provide this level of information. Having that information as your fingertips at all times will help you to make better decisions that will positively effect the financial health of your business. Your business is like a car driving down the road. You need to make sure the car is running properly and that you are focused on the road. You don’t close your eyes when you drive right? Make sure you are keeping your eyes open when you are running your business. Having a strong accounting function can help you with that. Simply reacting to what’s happening in your business at the current time can be a scary thing. Not knowing what’s coming can lead to making poor decisions. If you have your accounting under control, you will be able to plan ahead and be proactive. Proactive companies grow more then reactive companies. Plain and simple. 3) Do You Need Financing? Have you ever tried to get a loan or raise capital for your business only to get denied because your records were a mess? Or maybe the bank was looking for something specific, but you did not meet the criteria? If you have a strong accounting function, getting a loan or raising capital becomes significantly easier. Now, you still need to have a decent business but having poor financials will immediately limit your chances. You can also be planning ahead if you know what the bank wants to see. But the only way to do that is to monitor your financial situation closely and adjust accordingly. Many times bad accounting can lead to increased costs in the future. Trying to get someone to clean up the books for the past 3 years will probably end up being more expensive then if you just had someone doing it all along. And to top it off, you could have had financials in front of you every month! Also, if your books are a mess your tax preparation fees are going to be higher. If you can present cleaner books to your tax accountant, you should be able to negotiate a lower fee. For most business owners, selling their business someday is a huge part of their retirement plan. Wouldn’t you want to maximize that asset and ultimately your payout? I can tell you from talking with friends in the Mergers and Acquisition space that a bad accounting department will deter them from buying the business or lowering their price. You do not want to deal with that headache after all the blood, sweat and tears you have poured into your business. Do yourself a favor and get things right now so that you can maximize your profit on your exit. 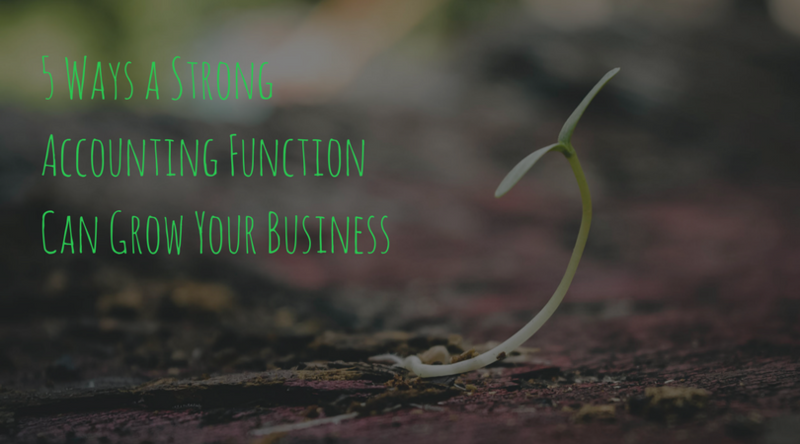 I’m sure there are many more reasons to have a strong accounting function in your business, but these are the ones I have come across the most. There are many options out there to achieve that goal. Obviously I think what we have to offer Is very high up on the list but I would be happy to speak with you about all your options if you are struggling to get your accounting under control. I hope at a minimum this article has you asking some questions about your business. Thanks again for checking in and I will talk to you next week!